Every time I make this meal, I'm so surprised by how good it is considering how simple it is to make! It looks delicious, smells delicious, and tastes delicious. I like to think that if my father were to have this, he would nod his head in approval and say, "Mmm, not bad! This is actually pretty good." Which in his terms, is a gold star approval. Especially since he's so protective over what "true chinese dishes" should taste like. And that imaginary interaction with my father always makes me smile to myself and give myself a silent pat on the back. Saute onions in large frying pan until golden brown. In a medium pot, boil water. Add carrots. Once carrots are half cooked (approx. 4 mins), add broccoli. 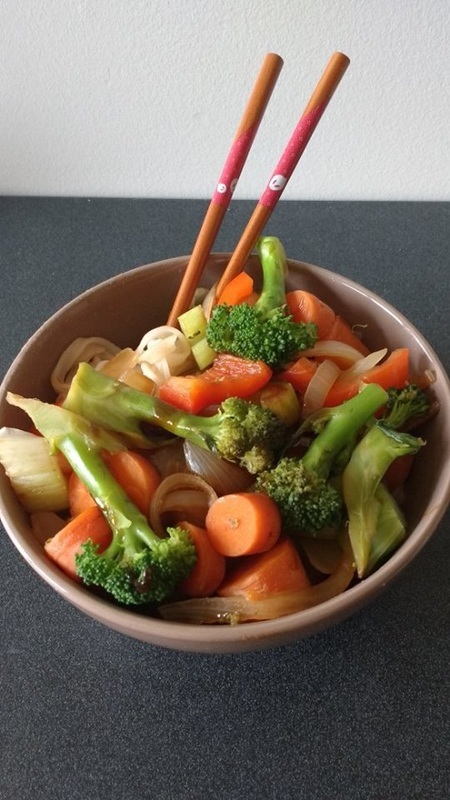 Once carrots and broccoli are cooked (approx. 2 mins), transfer to the frying pan, along with red pepper. 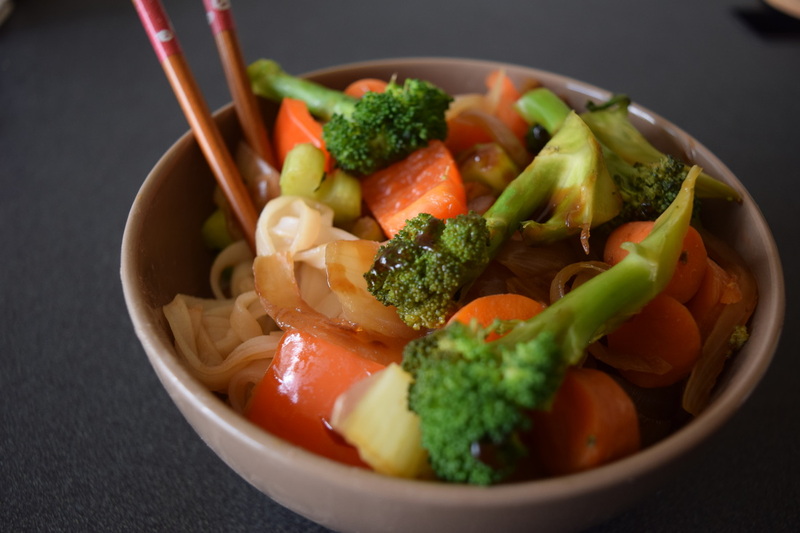 In leftover carrot water, add rice noodles. Cook as instructed on packet. 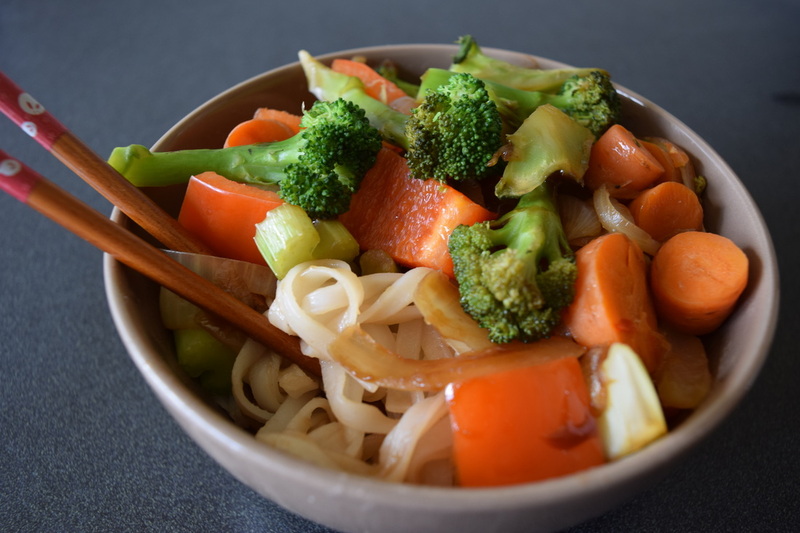 Add sauce to veggies and then serve over noodles. There's so much beautiful wiggle room with this recipe, since veggies can be eaten in any cooked state. So cook things how you please, and once it's all served, the only thing left to do it eat it with chopsticks! (or a fork, if chopsticks are beyond you).